We are delighted to bring you the recorded presentations and slides from two recent Regional Branch Meetings. The London & South East Regional Branch event featured leading speakers discussing nutritional approaches to supporting female health and hormone balance via targeted functional and epigenetic testing, and optimisation of detoxification pathways. Equally, the Midlands Regional Branch event featured leading experts presenting on evidence-based nutritional approaches to support cancer care. The British Association for Applied Nutrition and Nutritional Therapy (BANT) was interested to see the news reports relating to the article published online in The Lancet on 29 August 2017 relating to the PURE (Prospective Urban Rural Epidemiology) study, conducted over 10 years and encompassing 135,335 individuals within 18 countries, which found that higher carbohydrate intake was associated with higher risk of total mortality, whereas total fat and individual types of fat were related to lower total mortality. This new study provides an indication that the public health policy of low fat, high carbohydrate may have been erroneous. It certainly is a sign that evidence that high carbohydrate diets are not as health-promoting as the Eatwell Guide guidelines portray. In fact, to continue to support high carbohydrate diets as “balanced” is, according to the PURE study, detrimental to the general population’s health. 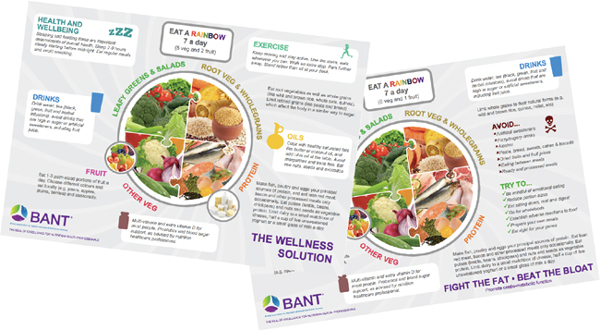 The, clear, concise format of the BANT Wellbeing Guidelines enables people to see easily what food choices they should be making. More detailed information is also given to guide people in how to make these choices and which other lifestyle factors they should be addressing. Weight Loss or General Health and Wellbeing: Everyone is unique but whatever your goal similar nutritional principles and health and wellbeing guidelines will apply. 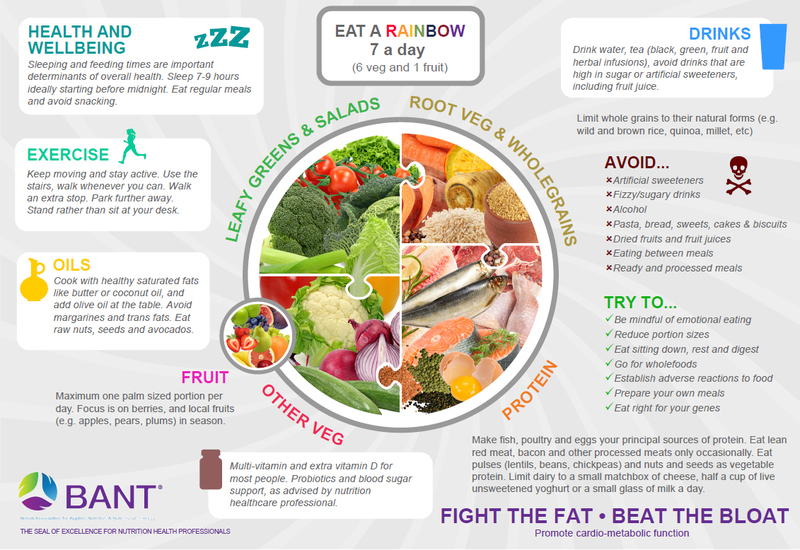 Eat a Rainbow: a varied diet of 7 differently coloured fruit and vegetables per day. Ensure protein is lean: fish, poultry, eggs and vegetable sources. Limit red and processed meat. Include healthy fats: avocados, nuts, olive oil. Cook with healthy saturated fats: coconut oil and butter. Choose root vegetables and whole grains instead of refined carbohydrates and grains: Eat sparingly. For Weight Loss: include exercise, limit portion sizes, don’t eat between meals. Avoid: Sugar, artificial sweeteners, alcohol and refined carbohydrates. Sleep and Exercise are an important aspect in overall Health and Wellbeing and Weight Management. Click here to download the PDF version of this response. The British Association for Applied Nutrition and Nutritional Therapy (BANT) is the professional body for Registered Nutritional Therapists. Its primary function is to assist its members in attaining the highest standards of integrity, knowledge, competence and professional practice, in order to protect the client’s interests; nutritional therapy and the registered nutritional therapist. Nutritional therapy is the application of nutrition science in the promotion of health, peak performance and individual care. It is a progressive approach to health optimisation. Registered Nutritional Therapists are recognised by the Professional Standards Authority to be as competent as other traditional healthcare providers. It has been recognised that they can make a difference by working together with healthcare providers as part of multidisciplinary teams under NHS commissioning. Welcome to the August edition of the BANT ENews. This month’s issue includes a fascinating feature article on Blood Chemistry Testing by Jonathan Cohen, an interview with BANT member, Jeannette Hyde, author of ‘The Gut Makeover’ and Dr Kate Lawrence about their collaboration on the paper: ‘Microbiome restoration diet improves digestion, cognition and physical and emotional wellbeing’ which was published in June this year and a really useful article from the Professional Practice Committee on managing client’s expectations. Access the BANT news here. Welcome to the August edition of the BANT ENews. This month’s issue includes a fascinating feature article on Blood Chemistry Testing by Jonathan Cohen, an interview with BANT member, Jeannette Hyde, author of ‘The Gut Makeover’ and Dr Kate Lawrence about their collaboration on the paper: ‘Microbiome restoration diet improves digestion, cognition and physical and emotional wellbeing’ which was published in June this year and a really useful article from the Professional Practice Committee on managing client’s expectations. Enjoy! The British Association for Applied Nutrition and Nutritional Therapy (BANT) welcomes Public Health England’s plans to engage in further work with food manufacturers to cut sugar in cakes, biscuits and chocolate by 20 per cent by 2020. Public Health officials said they will now work with the food industry to agree plans to tackle “excess calorie consumption” in a host of savoury foods – especially those regularly consumed by children. BANT Chair Miguel Toribio-Mateas said “As a leading non-governmental organisation with over 2,300 members accredited by the Professional Standards Authority to deliver nutrition advice, BANT is looking forward to being involved in the public consultation to help draw up the calorie reduction programme. I’d like to emphasise how disheartening it is, however, that taxpayers are funding public health work that focuses entirely on lowering calorie content. Reducing the size of pizzas may seem like an honourable move, but what is to stop an individual buying 2 smaller ones?” Toribio-Mateas continued: “The main issue that BANT has been highlighting for years is the fact that population-based dietary guidelines such as the Eatwell Guide are inherently flawed on a number of bases. Firstly, they are based on computer-generated models, as recently confirmed by Dr Louis Levy of Public Health England. Secondly, these computer “guesstimates” are all that Public Health England have to set an arbitrary high percentage of daily intake of carbohydrate, around 50% of total calories, most of it starch, which is akin to sugar. There is no real evidence from randomised controlled trials on the Eatwell Guide versus another dietary pattern that these guidelines are the basis of a “balanced health diet”, as we’ve been led to believe by Public Health officials for years. Dr Levy and Dr Tedstone have been invited to comment on how different individuals have different levels of tolerance to carbohydrates and how this affects their ability to stay lean or to lose weight if they’re overweight. They’ve both rejected to comment on the matter. It is disappointing that Public Health officials are not willing to engage in healthy dialogue with stakeholders such as BANT about matters that affect the health of the nation. Public Health England keeps defaulting to “one-size-fits-all” models of nutrition advice that can never meet the needs of every single individual in the country. One could argue they’ve actually contributed to the epidemic of obesity and diabetes (type 2) we’re experiencing. 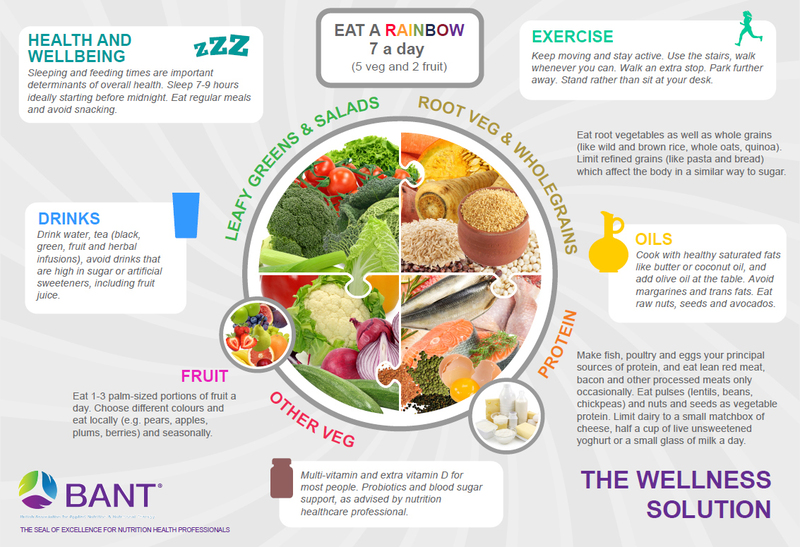 Eat a Rainbow: a varied diet of 7 differently coloured fruit and vegetables per day contributes to better gut microbial diversity, which is known to be associated with overall better health. Include healthy fats: avocados, nuts, olive oil, a little butter. Choose root vegetables and whole grains instead of refined carbohydrates and grains. Click here to download the PDF version of this comment.